Comfort. Just because your space is simple doesn’t mean it has to be uncomfortable or stiff. Add enough pillows, blankets and rugs to make it easy to curl up on the sofa with a good book or to watch a movie. If displaying the throw blanket on the sofa is too much for the room, store it somewhere it won’t impede the look but is also easily accessible. Openness. 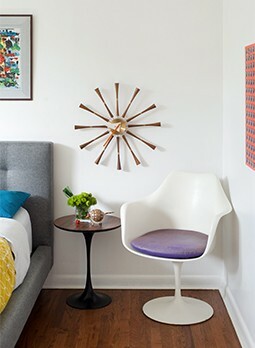 Midcentury style was at its heyday during the baby boom from 1946-1964. This means lots of kiddos running around. Designers wanted to make homes that were family-friendly, and open spaces encourage folks to gather together. Avoid items that make the room feel small or closed, such as high-backed chairs, low-hanging chandeliers and heavy curtains. Instead, opt for light, airy furniture to keep that laid-back and open feel to your living space. Color. Add a fun element to the space with bold, bright colors. You don’t have to stick to one or two colors—use any combination of classic midcentury hues such as tangerine, aqua and olive green. As long as the colors have the same tone, they’ll go well together. This will also help convey to visitors that they can relax in the space—kick off their shoes for an evening of good conversation and an Atomic Rancher.